Use these instructions to publish and schedule content from the MoveSpring Content Library. The MoveSpring Content Library gives you access to a curated list of articles, videos, and posts that you can publish to your group through the content module. 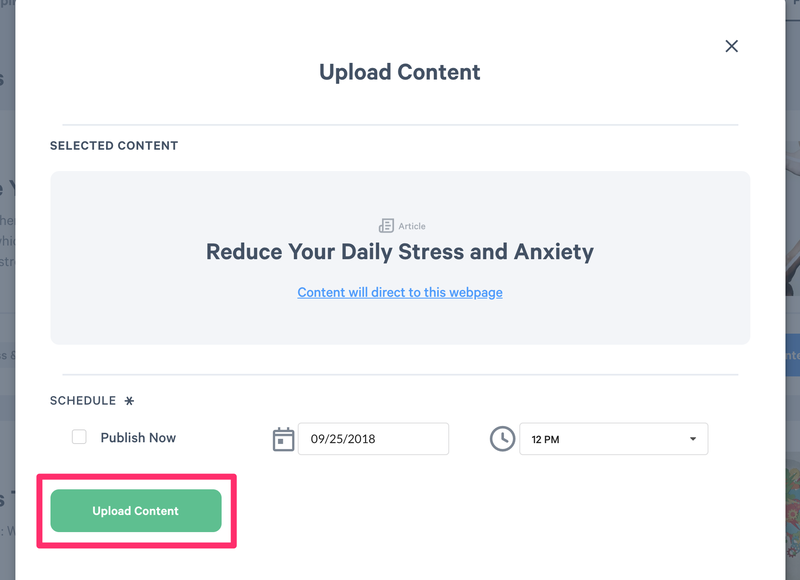 Subscription plans with access to this feature can select content to be posted immediately (for a started group) or schedule to publish at a future date. Below, we'll walk you through how to navigate the MoveSpring Content Library and how to upload your selected content to your group. You'll then be directed to our MoveSpring Content Library. Our content library currently holds hundreds of videos, articles, and posts related to healthy eating, exercise, wellness facts, and more. You can select and use any content to post to your users throughout your challenge! If you notice a lack of any particular topic your users would enjoy, please let us know! If you've selected a video or article you can preview the content by clicking "Content will direct to this web page." You'll have the option to "Publish Now" by checking the box to the left. You can also select a future date by clicking in the date and time boxes accordingly. Your content will either publish immediately or queue for release at a future time, according to your selection! Please note: you will not be able to "Publish Now" if your challenge group has not started. If you have any questions please reach out to our Support team by clicking the blue chat icon in the lower right of your web browser, or "Contact Support" in the profile section of your MoveSpring app.